Crude oil prices printed new highs during yesterday's session at $55.35 but quickly reversed failing to settle above the $55 critical level. The retreat in prices is attributed to the positive progress in US-China trade war and the improved performance in global equities. Moreover, a broadly weaker greenback and increased supply disruption risks amid US sanctions on Venezuela, remain the main drivers behind the bullish rally in oil prices. Crude oil prices pushed above the $55 level and printed new highs of $55.35 only to quickly reverse to end the day in the red. 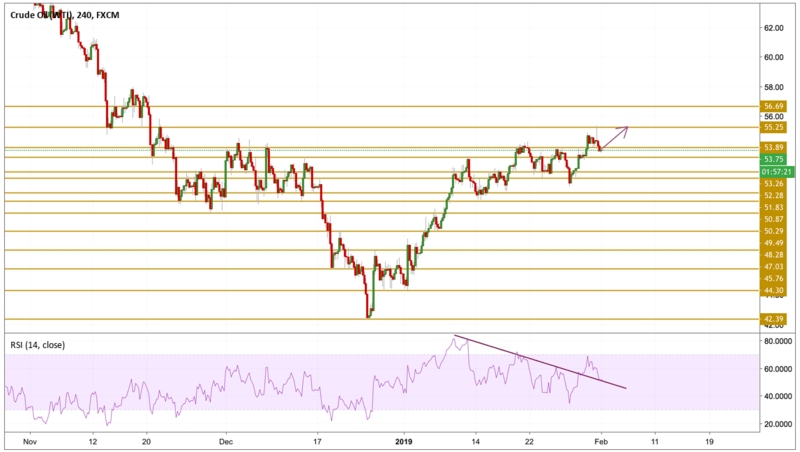 The price is currently hovering below the $53.89 resistance level with a neutral momentum as we can see on the RSI chart. We expect a continuation of the recent upward move with our focus on the $55 critical level.